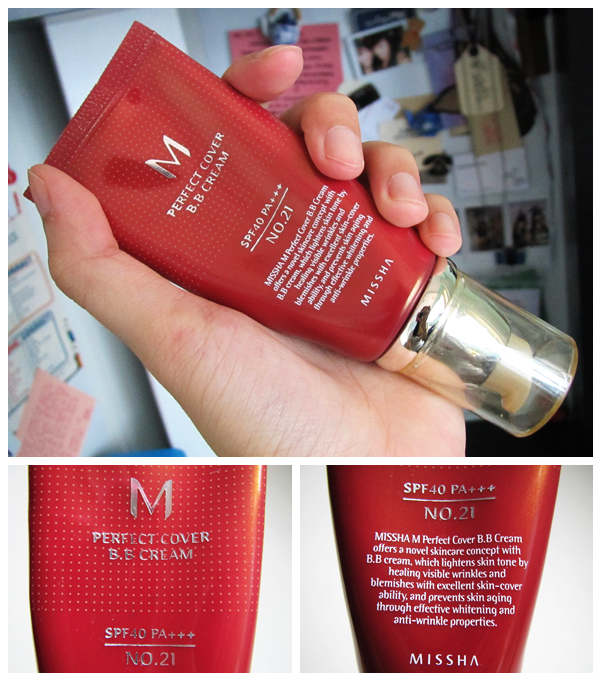 Missha's Perfect Cover B.B Cream SPF40 PA+++ claims to lighten skin tone by healing visible wrinkles and blemishes with its excellent coverage. It has skin-enhancing properties as well, such as preventing skin ageing and providing effective whitening and anti-wrinkle powers. The 50g rose-gold tube isn't exactly what I would call travel-friendly. The top is bulky and rather excessive. But I guess the thick, silver top makes the whole tube look classy. I appreciate the pump because it means there is no direct contact with all of the product and you know how I'm so particular about this! So yay! Thumbs up for hygiene! :D The pump is also easy to control which is good because on happy skin days, I just need half a pump! The B.B. cream comes out rather thick and with a greyish tint. It has a very pleasant scent to it, almost floral I think. Though it comes out thick, once it is blended into the skin, it feels incredibly light and comfortable. 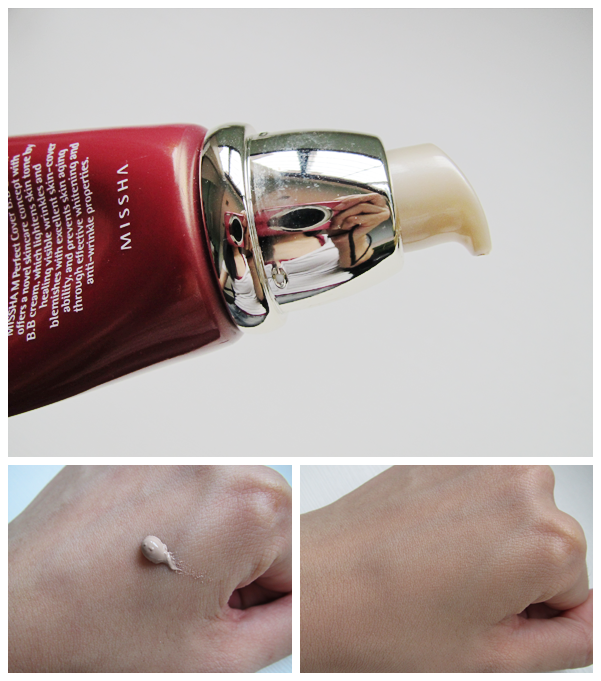 It gives a dewy finish so for those who have oily skin, you will definitely need to powder up. The coverage is excellent. It conceals all my redness and spots so well that my friends think I have flawless skin. But nope, I wasn't born Photoshop-ped... This is my secret (Or rather, was. I'll explain later.)! It lasts throughout the entire day that I'm in school, which is about 8 hours. My T-zone does shine like a star at the end of the day so as mentioned earlier, a mattifying powder will make a very good friend when you are using this. As for the skin-enhancing properties (Whitening and anti-wrinkles.)... I don't see any marked difference. I don't think I have got any fairer. Given that I am still a little young for wrinkles (SIGH. A few more years to go, Char. Just a few more...), I look at my laugh lines. I have a particularly deep on the left side of my face and it looks just as deep as before. Hmm... I'm not sure if laugh lines and wrinkles are the same. But anyway, my skin feels a little plumper after each usage and it's definitely moisturizing. Mich mentioned that it helped her skin recover when she was breaking out. For me, I still suffered the occasional breakouts and a peak of them always occurs during the examination period so I would say that it helped maintain my skin condition. But I wouldn't give it a lot of credit for this. It isn't the main point of the product, for me. No. 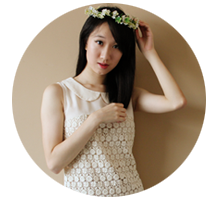 21, Light Beige suits your skin colour? I have a tube but I think it's a tad too dark for me! Hey Ariel! Omg! I didn't see your comment! Sorry! ): Yes, it does! Perhaps, you can darken it with a bronzer?